If you’re a pressure cooker newbie, like me, I’m here to tell you that cooking with your electric pressure cooker doesn’t have to be intimidating! Once you realize the magic that you can create in these babies, you’ll never look back. Today I’m sharing a recipe that you can take from the fridge to the table in an HOUR and it tastes like you’ve been slaving over a hot stove ALL DAY. But shhhhh …. it’s our little secret! 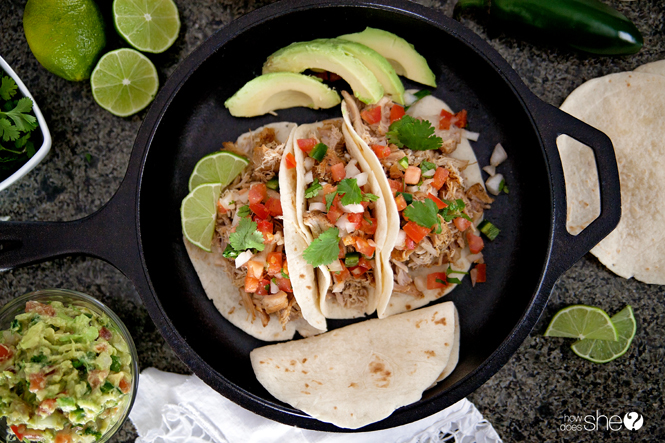 These pressure cooker pork carnitas taste amazing with the perfect balance of seasonings to make your taste buds sing and dance! For real, guys, these were a huge hit with my entire family – they would have given them two thumbs up if they hadn’t been so busy stuffing these pork carnitas into their precious faces. Okay, I was doing my share of face stuffing, too, but that’s just one more secret between us. You can half the recipe and it works just as well – it’s a wonderful dish for potlucks, or for a tasty meal in an hour that tastes like you’ve been slaving over a hot stove all day. YUM! 25 Mexican Slow Cooker Recipes Ole’ Tonight! These look amazing! I bet they’re so delicious. Great idea! Would this recipe work in a crockpot? For a lot longer cook time? I imagine it would, as you said, for a longer cook time. I used to use my crockpot to make pulled pork before I got my Pressure Cooker XL so I don’t see why this would be any different.